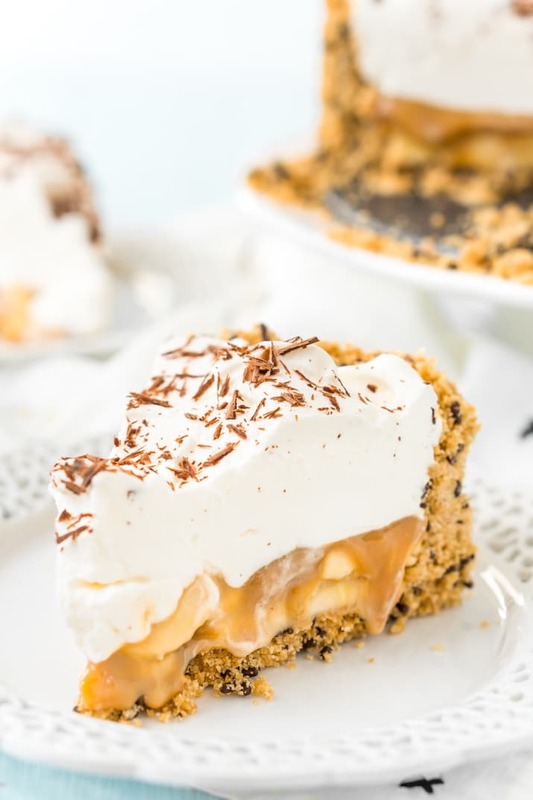 Banoffee Pie is a classic English dessert made with a graham cracker or biscuit crust a loaded with slices of banana, a silky layer of toffee caramel, and a thick layer of freshly whipped cream. 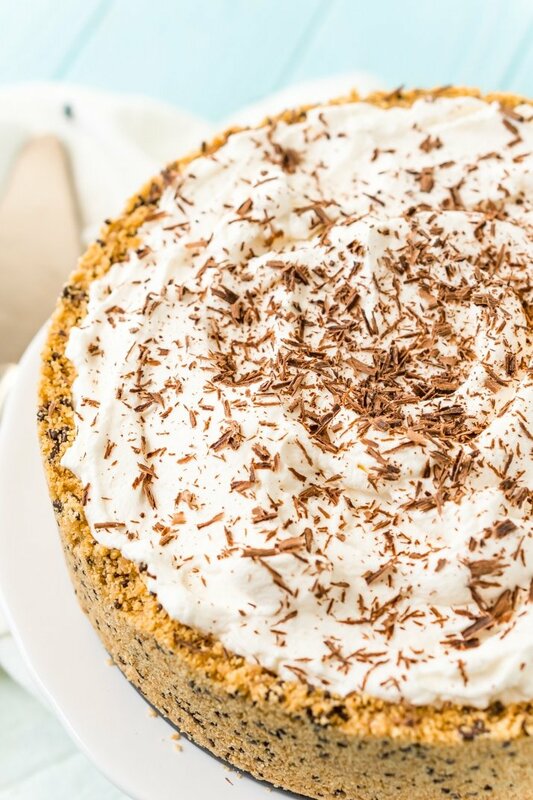 Banoffee Pie is my all-time favorite dessert! Every now and then, a dessert walks into your life that changes the way you think about food. I still remember the first time I cracked that torched sugar crust on a creme brulee, the first time I indulged in a cake ball, and the silkiness of that first bite of gelato. Well, Banoffee Pie was another one of those, I was completely blown away by it. Banoffee Pie is an English dessert that was created by a chef named Nigel Mackenzie. The name comes from the main ingredients: banana and toffee. You can make this pie in a number of different ways, but it always has bananas and toffee with a graham cracker or biscuit crust and whipped cream. In recent years, chocolate has found its way into the recipe, and boy does it take it to a whole new level. Depending on who makes it or what you like, the layers can differ, you may have a banana cream layer or you might just have sliced bananas and an extra thick layer of toffee. I love that there are so many different ways to customize this dessert. If you visit the UK, many restaurants will claim to have the BEST EVER Banoffee Pie, but each one is different. The slice I had in Edinburgh this past fall was similar to this recipe but there was a very small amount of toffee and even more whipped cream. 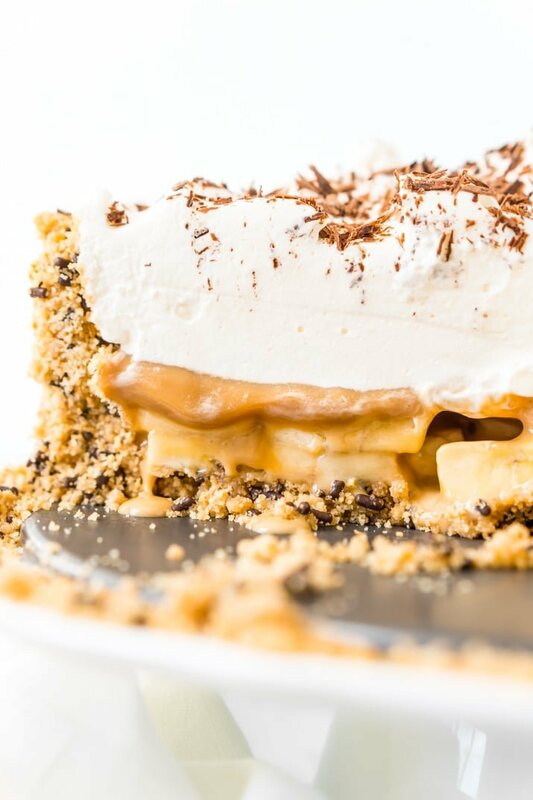 I made my first Banoffee Pie at home a few years back and my personal recipe has adjusted over the years as I’ve discovered what I like best. I love having lots of whipped cream because it’s light flavor really helps balance the rich and sweet toffee caramel sauce. I also like to top my pie with chocolate shavings. Some leave it plain and others use cocoa powder or sprinkles or even more bananas. This is my all-time favorite dessert, the flavors come together so perfectly, and the filling is just amazing. Oh and the crust. THE CRUST! Yeah, so I’ll never make another graham cracker crust without chocolate jimmies again. Okay, they might not go with everything, but they sure made this dessert absolutely insane. Begin by preparing the crust according to recipe instructions. This can be done in advance if desired. Once the crust is ready, slice the bananas into 1/2 inch thick slices and arrange them in two layers on the bottom of the pie crust. Next, pour the Dulce de leche sauce on top of bananas and spread out evenly. In a large chilled bowl or stand mixer fitted with a whisk attachment, whip the heavy cream, powdered sugar, and vanilla, until stiff peaks form. 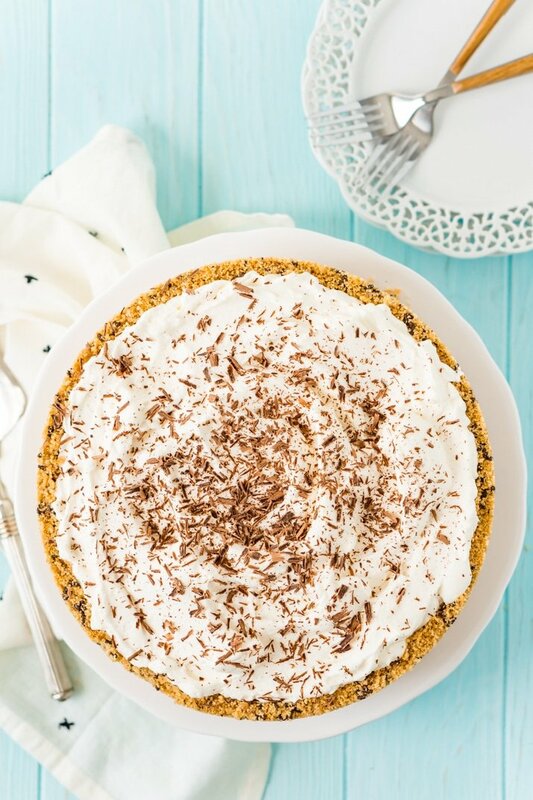 Top the pie with the whipped cream and Sprinkle chocolate shavings all over the top of the pie. Pin This Pie Recipe for Later! This post was originally published in January 2014 and was updated in February 2018. 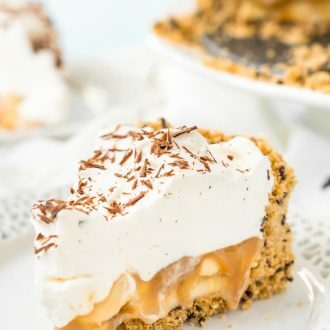 Banoffee Pie is a classic English dessert made with a graham cracker or biscuit crust and loaded with slices of banana, a silky layer of toffee caramel, and a thick layer of freshly whipped cream. Prepare crust according to recipe instructions. This can be done in advance if desired. Slice the bananas into 1/2 inch thick slices and arrange them in two layers on the bottom of the pie crust. Pour the Dulce de leche sauce on top of bananas and spread out evenly. You can use either homemade Dulce de leche or storebought for this recipe. Sometimes I like add Bits o' Brickle Heath Toffee Bits to the filling or as a topping for a bit of crunch and extra toffee flavor. Oh, I love banoffee pie!! It’s been years since I’ve made it and I’ve practically forgotten about it. Thank you for reminding me. I’m remembering how good it was. Now, I don’t have to look for the recipe. You definitely need to make one again soon! I’ve never had Banoffee Pie but I think that needs to change ASAP. It looks AMAZING! Just came across this recipe though I see it is from a while back. Just had to say: GORGEOUS! I love banoffee pie. Looks Delish!!! 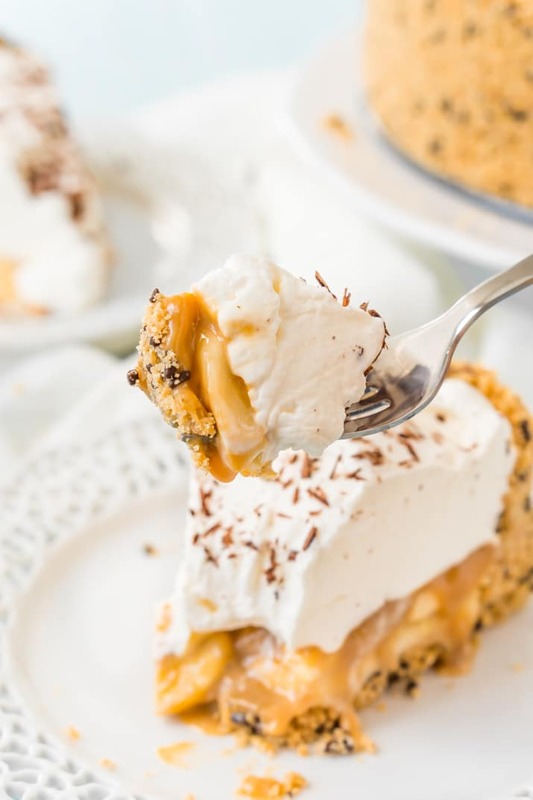 I have been wanting to make Banoffee Pie for years now and plan to make this one for easter. 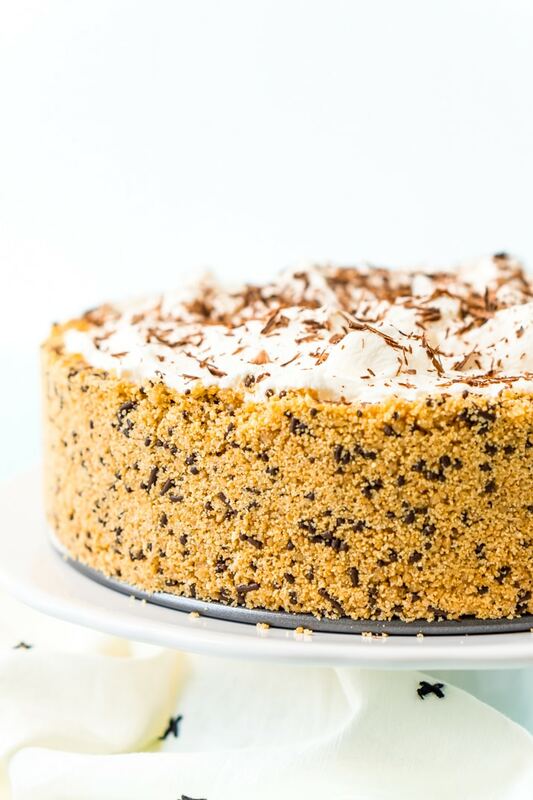 Love the idea of adding chocolate sprinkles AKA – Jimmies to crust! Did you bake the crust for this pie? Have you tried it with coconut? Hi Elizabeth, I did not bake the crust for this recipe, but you definitely can! Just follow the baking instructions a let it cool a bit before adding the filling. I have not tried making it with coconut.